Form 13F - What Does It Mean? 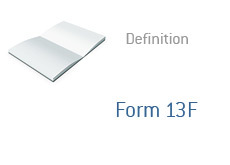 What is a Form 13F? What is the definition of Form 13F? In which situations must a Form 13F be filed? According to the SEC, "institutional investment managers who exercise investment discretion over $100 million or more in Section 13(f) securities MUST report their holdings on Form 13F with the SEC." "2703718" is the value of the securities (x1000).. 159794229 is the number of shares that Paulson & Co Inc. held as of September 30th, 2009 (159,794,229)..
Form 13F's must be filed on a quarterly basis, and usually show up about 4 weeks to a month and a half after the end of the quarter.